AMC’s highly anticipated Breaking Bad spinoff Better Call Saul came prepackaged for the annals of television history. The spinoff used to be a go-to format for networks looking to cash in on built-in fanbases. It’s a practice we now call franchising, and it concerns largely CBS and Marvel. But, as Andy Greenwald notes at Grantland, the spinoff as a genre has been so inconsequential that even the respected and watched Frazier begat little enthusiasm for further adventures. None of that has slowed the pleased reviews and budding froth at viewers’ mouths. Better Call Saul isn’t simply programming opportunism. Its ingredients are themselves potent. Few recant Breaking Bad’s stature as one of TV’s best. And we can unanimously agree that this was an increasingly brutal show. But Gilligan and crew always had Bob Odenkirk and the Saul Goodman card—a whip of character trickery so tonally different from the show, we can’t imagine how Breaking Bad would have survived itself without him. And so, here are some of the Breaking Bad moments for which we were most grateful Saul was called—and the 5 reasons we are most excited for tonight’s big premiere. A sleazy, witty, mouthy lawyer is nothing if not capable. Peter Gould, who penned Saul’s introductory episode, wasted little time in showcasing Saul’s survival instincts. Dumped in front of a staged execution setting so as to be dissuaded from cracking the early baby blue operation, Saul weasels his way out of what looked, to him, like impending death. These guys, Jesse and Walt, don’t need a dead lawyer, Saul realized: they need “a criminal(’s) lawyer.” “Better safe than sorry—that’s my motto!” He even comes out two dollars ahead on the night, instead of six feet under. For a solid season, Saul has a good run. He’s a problem solver. He’s, as you see above, an educator. Moreover, he’s a mentor. When the boys run into problems, Saul sends in Francesca to enable. These were his glory days. From using their son’s drug activity to swindle the Pinkman home for said drug pedaling son, to ensuring the Heisenberg brand is copacetic, Saul oiled their terribly calibrated, but nonetheless relentless machine. During Season Four, Saul lost a lot of that mojo. The nature of his profession is to put out fires, not stoke them. Everything Walt did that season was kindling, and then Gus’s lab was smoke and melted cameras. Saul tended to the patchwork of his clients’ associates, until, by the final season, his guys were back in control. That surge in profile would ultimately lubricate their downfall. But it did provide fertile ground for one last opportunity to piss on Hank’s shoes—a temporary restraining order against the D.E.A (in episode 5.06 “Buyout”). There’s gusto, and then there’s gusto. Breaking Bad took great care to dismantle characters of great pride. Most died. 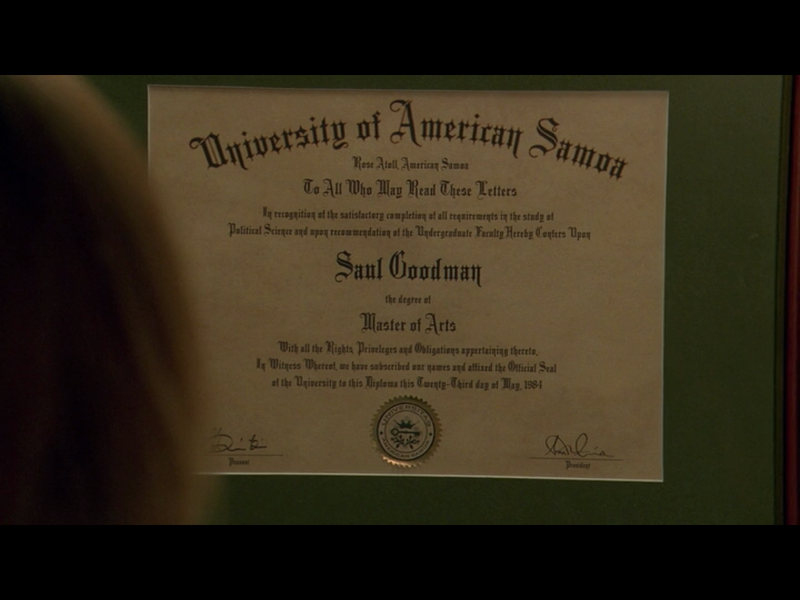 Whenever things seemed their most dire, Saul’s answer was the one that led to self-preservation: run. The man who once posed the question, “What good is money that doesn’t spend?” understood that money also doesn’t spend itself. No amount of money would keep him magnetized to Albuquerque when Heisenberg’s doomsday clock hit zero. The show was filled with deceit, terrible deceit. So, Saul was never as heroic, even in despair, as when he opts for the dream of managing a Cinnabon over gobs of cash and likely imprisonment, if not death. When he was honest, he just wanted to live. There were a lot of colors and scheming to scrape away to get to that. What got us there, from Jimmy to Saul? We can’t wait to find out tonight. Kyle Burton is a freelance critic and an inaugural recipient of Indiewire and Sundance’s Roger Ebert Fellowship. You can follow him on Twitter.